In time, Bal Fell was abandoned, and the only thing left standing were the Daedric ruins. 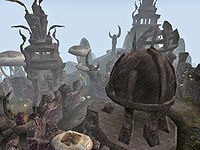 Daedra often plagued the ruins, and the Ordinators were charged with keeping away Daedra worshippers. Sometime before 2E 583, a Nord priest of Sheogorath named Mad Griskild set up his workshop in the ruins and began experimenting with alchemy and Daedric magic to create magically enhanced spiders. An expedition to the ruins led by a famous Breton archeologist, Lady Clarisse Laurent, fell victim to Griskild's mind-controlling spiders, but the expedition members were saved by the Soulless One, who killed the Nord. Lady Laurent later sent Griskild's research to a scribe living near White Ridge Barrow on Solstheim, which ultimately led to the creation of unique magical spiders that would be rediscovered in the barrow in the Fourth Era. 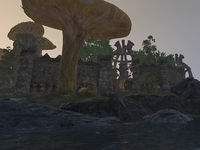 By the late Third Era, the ruins had obtained a nasty reputation, and wizards from Great House Telvanni set up competing camps of hirelings and adventurers to explore and loot the ruins. In 3E 427, House Telvanni and the Mages Guild sent expeditions to clear out the Daedra. They were aided by the Nerevarine, who looted the Ten Pace Boots from the ruins.